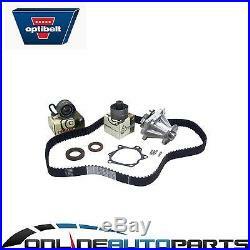 Water Pump Timing Belt Kit for Patrol GQ Y60 GU Y61 RD28-T Turbo Diesel 8/9500. Note: model prior to 8/1995 has different belt available on request. Front Engine Crank Shaft Seal. Head Office + Warehouse location. But fear not, we have created a table with more specific and relevant fitment information for you. This is a vehicle specific part, please make sure your vehicle is listed in our verified table below. 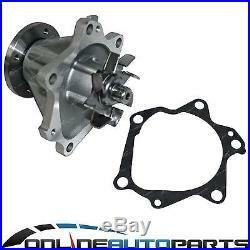 6cyl RD28T 2.8L 2826cc. Turbo Diesel DI 12v SOHC. Models prior to 8/1995 have a different belt. 6cyl RD28Ti 2.8L 2826cc. 1996 1997 1995 1998 1999 2000. Search more parts for my vehicle. Optimum power transmission even after thousands of operating hours andwith extreme loads - for these high requirements, OPTIBELT developed theZRK timing belt. The sections and belt constructions of this high capacitybelt have been perfectly designed - down to the smallest detail. The materials used are also perfect for the job: wear-resistant polyamide, zero stretch glass fi bre cord and durable polychloroprene elastomer. Due to the individual components being tuned optimally to one another, the OPTIBELT ZRK achieves excellent results with regard to performanceand life. Especially in the compact drives of modern engines its efficiencyis unrivalled. The OPTIBELT ZRK is a special development for the camshaft drive inautomotive engines. Extraordinarily resistant against cold, heat and oil. It is always Encouraged + recommended that a licenced workshop or tradesperson carry out the fitting procedure andthat workshop manual, Factory Specifications and relevant safety procedures are followed. You can also pay in-Store. Please note that not all items can be combined as they do not pack well together. We select the carrier at our discretion to suit your order and area unless you are choosing to use own carrier account. Australia Post - Eparcel Road. Australia Post - Eparcel Express. Please choose your parts carefully and make sure you have your correct vehicle information. With your co-operation we will work hard to resolve any issues quickly. Ask a question about this product. Link to formulate a question or check our FAQ. Or visit our store HERE. 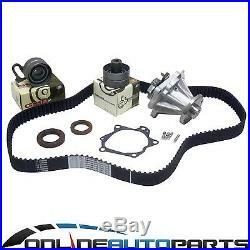 The item "Water Pump Timing Belt Kit for Patrol GQ Y60 GU Y61 RD28-T Turbo Diesel 8/9500" is in sale since Saturday, February 21, 2015. This item is in the category "Vehicle Parts & Accessories\Car, Truck Parts\Engines, Components\Timing Components". The seller is "onlineautoparts" and is located in Warehouse - Brisbane Northside - Virginia QLD. This item can be shipped worldwide.